Hey everybody! So I’ve been seeing these rings on everyone lately. 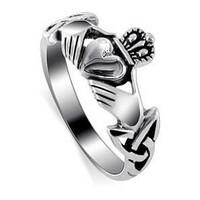 This is the Claddagh ring. It has becoming way popular lately. But this cute ring also has a very sweet meaning to it. Long ago a young man was captured and sold into slavery from the fishing village of Claddagh. Many years passed and he wondered if his true love would wait for him. Over the years he stole tiny bits of gold from his master to make her a ring. He fashioned a heart for love, a crown for loyalty and hands as a symbol of friendship. After many years he finally returned home to Claddagh. Upon his return and to his joy he discovered his true love had waited for him. 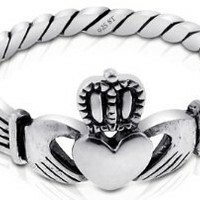 He gave her the ring as a symbol of their love, loyalty and friendship forever known now as the Claddagh. The traditional ring is like the ones you see above, in silver or white gold, but there have been other variations of it in gold or with gemstone hearts. Get one now on Wanelo!